After four years of living abroad in Australia, my husband and I finally came home for a much-needed visit (to the US). One of our goals was to spend some time rediscovering our own country, and the first thing on my list was to explore the hometown of some of America’s most unique and talented artists, Gee’s Bend in southern Alabama. Four years prior, as a very homesick quilter living overseas, I found myself searching for an outlet to express my feelings in a positive way. My natural inclination was to create a work of textile art but I wasn’t yet finding inspiration in the new landscapes of my adopted Australian home. It wasn’t until I stumbled across an image of a very famous Gee’s Bend quilt that I found the inspiration I was looking for. A week later, I began what would become my first series of improv quilts. I spent months dyeing fabric, improvising quilt patterns, and almost, ALMOST, forgetting that I missed home. Though I had seen Gee’s Bend quilts before, it wasn’t until I was very far from home and seeing them with new eyes that I understood how truly unique and innovative these quilts are. With the free form, or ‘my way’ approach to quilt design, I found the outlet of expression I had been searching for. As I shared my art and inspiration with family members in Alabama (my husband's home state), my father-in-law sent me articles about the area’s rich quilting history when he came across them. This is how I found out about the Gee’s Bend Quilt Murals—in 2006, after the quilts had been discovered and become well known, the US Post Office issued a series of ten stamps with images of the quilts. Between 2007 and 2008, ten large murals were painted and erected in Gee’s Bend, one for each stamp. Seeing these murals, and the community around them, was the primary goal of this part of our long American road trip. However, they were now ten years old—we had no idea what we would find. To get there, my husband and I drove first to Camden (the closest town across the river) where my husband’s family lived when he was born. Camden itself is a picturesque old southern town, reminiscent of Whistle Stop, of Fried Green Tomatoes fame. White clapboard churches spring up every few hundred feet along Broad Street, framed by large, full canopied trees and manicured lawns. Our first stop in Camden was Black Belt Treasures. Black Belt Cultural Arts Center is a not-for-profit organization promoting local artists and artisans from the so-called Black Belt region of Alabama (named for the rich, top soil found in the area). If there was ever any doubt that southern Alabama was a rich and fertile ground for the arts (among other things) Black Belt Treasures is evidence that the folk art tradition of this area is alive and well today. From floor to ceiling, stacked on top of tables and tucked in shelves, we found high-quality art and fine crafts of all mediums. From paintings to quilts, jewelry to basketry, Black Belt Treasures was a wonderful showcase of all the region had to offer and all at a very reasonable cost. As I considered my need for a hand-woven basket backpack, my husband started chatting with the shop proprietor about the area and the quilters across the river. Their conversation was cut short when he mentioned that we would be taking the ferry across the river to Gee’s Bend. The shop keeper pulled out her ferry schedule and explained that it been recently updated (but not yet online) and that our ferry was leaving in ten minutes. I was quickly relieved of my basket backpack buying contemplations and in less than ten minutes, somehow, we were out the door and pulling onto the ferry. The Gee’s Bend ferry is of significant historical importance to Benders, as they are collectively known. Nestled along the Alabama River in Wilcox County, Alabama, Gee’s Bend (officially named Boykin) sits in the belly of a bulbous river bend, surrounding the community by water on three sides. Because Gee’s Bend is effectively isolated, the ferry is an important link to the outside world and the nearby county seat of Camden. In the 1960s, inspired by Dr. Martin Luther King, Jr., many Gee’s Bend residents participated in the march from Selma to Montgomery and registered to vote across the river. Because of these actions, many Benders lost their jobs and ferry service was terminated, further isolating the Bend from easy access to the rest of the world. The ferry would not resume service until 2006. 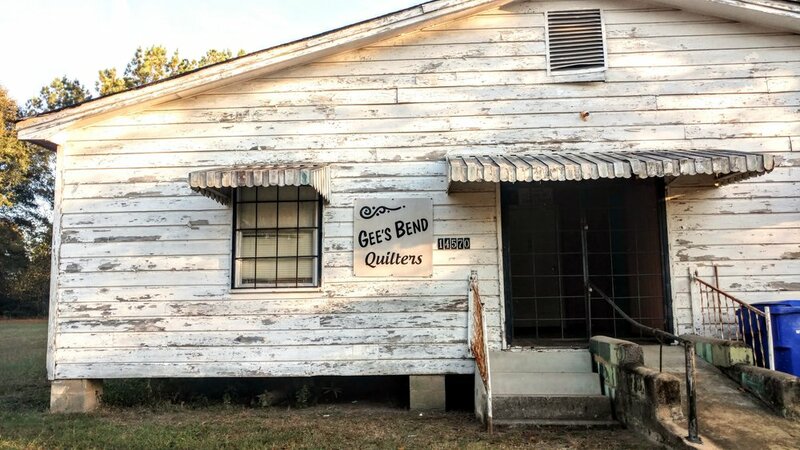 This geographic and cultural isolation, in part, lead to the development of the unique style Gee’s Bend quilters are famous for today. Though it is not a long trip at just about twenty minutes, the ferry from Camden to Gee’s Bend is stunning. With the sun low in the late afternoon sky and the wind almost non-existent, we watched as ripples of blue orange water spread out from the ferry into sheets of almost still river. With large trees lining the entire shore of the river, there were no signs of buildings or development for most of the journey. It was a scene where Huckleberry Finn would not have seemed out of place. As we drove off of the ferry onto the other side, we were finally there. Luckily, we had loaded the map of the Gee’s Bend murals onto our phones before heading out, because we lost service almost immediately after leaving the ferry landing. We decided to head right on county road 29 (off of another road also called 29, which was more than a bit confusing) instead of trying to do each mural in order. We headed straight for mural number five, “Chinese Coins,” by Alonzia Pettway. I’m not sure what I was expecting, but I can say that seeing my first Gee’s Bend quilt mural was a lot like seeing my favorite band play my favorite song live for the first time. Each mural, standing about ten feet tall on what I affectionately named ‘quilt stilts,’ sits by the side of the road in a location at or near the homes of many of the original quilters. While these murals are beautiful in and of themselves and would be just as beautiful placed anywhere else, there is something special about seeing them in the context of the community in which they were created. As we drove towards quilt mural number six, “Bars and String-pieced Columns,” by Jessie T. Pettway, we were stopped by a ball rolling into the street and a group of small children cautiously chasing after it. They grabbed their ball and stayed along the road while we passed to wave and say hello. Many times as we drove through Gee’s Bend, community members stopped to wave and welcome us. Each new quilt mural was a special treat on what felt like a treasure hunt. Without cell phone service and a working map, we were able to find most of the murals, but had to back track a few times down dirt roads to find them all. Almost ten years old now, some of the murals have faded and the paint begun to peel, but just like the quilts they are based on, they gave the impression of a good, well loved, often used family heirloom. We made our way to the Quilter’s Collective where we hoped we might find some quilting being done but they had already closed up shop for the day (we were told to call ahead next time as they don’t keep regular hours). Though it would have been great to see, I was happy just to be in the place where such famous art was created. As the sun set, we made our way north towards Alberta to see the last two quilt murals: “Blocks and Strips,” by Annie Mae Young and “Medallion with Checkerboard Center,” by Patty Ann Williams. As we drove out of Gee’s Bend, locals were beginning to gather at the end of the day on porches and in front yards. Over the balcony railing of one front porch a large green quilt hung in front of a group of women gathering for what I liked to imagine would be a night of stories, singing and quilting. In the end I found myself sad to have to say goodbye to Gee’s Bend and the quilt murals; I would have been happy to turn around and do the whole trip over again if not for the fast approaching night.